Browns Restaurant Bar (restaurant web site) 1165 Mainland Street, Vancouver, phone (604) 696-9335, is a casual and fun restaurant in Yaletown, an upscale dining neighborhood in Vancouver. Keep tabs on your favorite sports teams on the flatscreen TV’s while enjoying a California-style burger, or even a fancy entree. 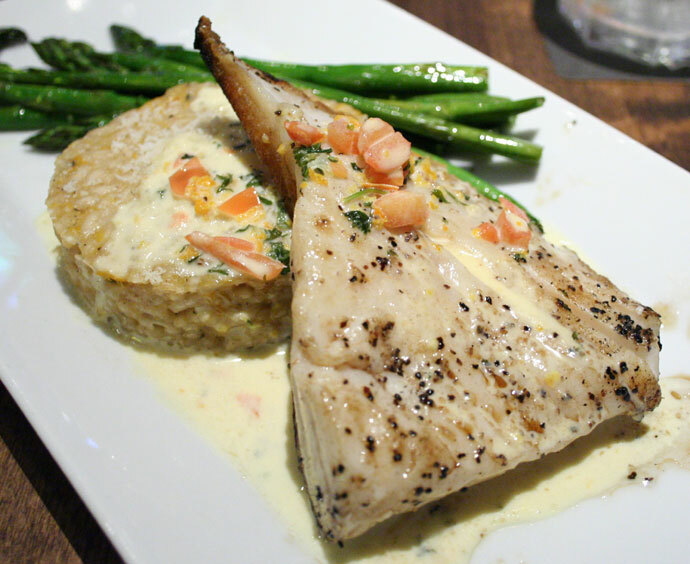 I really enjoyed my Pan Seared Halibut (pictured below), which was lightly blackened and served with a delicious “citrus risotto cake”. Its price varies according to market, but was around $22. 10,706 views. This entry was posted on Wednesday, June 20th, 2007 at 5:52 pm	and is filed under Bar, Casual, Downtown, Food Photos, Reasonably Priced, Restaurant, Seafood, Trendy, Vancouver, Vancouver Restaurants, Yaletown. You can follow any responses to this entry through the RSS 2.0 feed. You can leave a response, or trackback from your own site.